As the next step in American Express’ recently launched “Powerful Backing: Don’t Do Business / Don’t Live Life Without It” global campaign, the company is backing ‘up and coming’ local artists by giving them larger than life canvases across London, New York and Los Angeles. 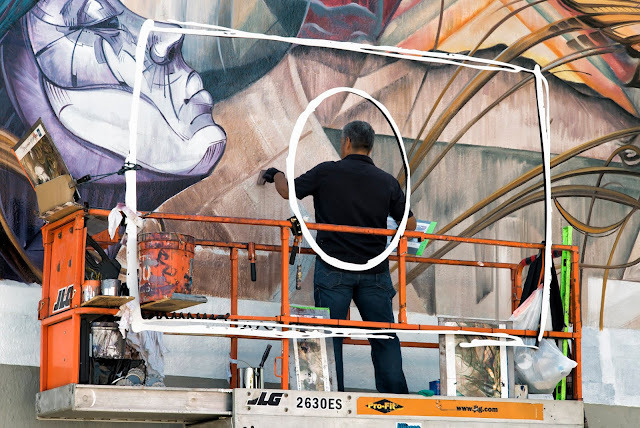 “The Backing Billboards by American Express” will showcase artists work on hand-painted billboards in their local cities with the goal of taking their art and careers to the next level. The paint has just dried on the second billboard which features the artwork of Los Angeles artist, Hans Walor aka VALØR, whose style “invites viewersto move beyond their ordinary reality.” Hans was once laid off from his 9-5 job which led him to pursue his passion for art and now one of his paintings is showcased beautifully on the corner of Melrose Ave and N Genesee Avenue in LA. American Express also recently invested $1 million dollars through its American Express Music Backers Program, backing Australia’s music industry, which is on the decline. As part of that investment, over the next 12 months American Express will offer music businesses, artists and fans the chance to access financial support, mentorship or other tools to help them succeed. The grant will also help to connect music fans with their favorite bands, rewarding them for their support of the live music scene.